K2 2018 Summer Coverage: Good Day for K2 Summits, More to Come K2 2018 Summer Coverage: First K2 Ski Descent! Following a near record day of K2 summits, more teams stood on top of K2 on Sunday July 22nd, 2018. Big weather is forecasted to move in on Tuesday thru Thursday so now is the time to push for the summit of K2. I’ll update this post as new information becomes available over the next 12 hours. Japanese K2 expedition, Summit push: Six members (Mr. Higashiyama, Mr. Taguchi, Mr. Watanabe, Mr. Iizawa, Mr. Yusa, Ms.Hayashi ) and two HAPs left C4 last night for summit push. Today(7/22), at 4:00 local time, Mr. Higashiyama reached Bottle Neck(8200m). Two members (Mr. Oyabe, Mr. Shirakura) decided not to pursue the summit push, due to health condition. Of note yesterday Noel Hanna with Seven Summits Treks and today Jason Black with Madison became the second and third Irish to summit after the tragic story of my friend Get McDonald in 20o8. Well done to both. I made the case a few years ago that K2 will never be Everest and I stand by that even with the good summit numbers over the last two days. Everest is all about altitude while K2 is all about altitude AND climbing. 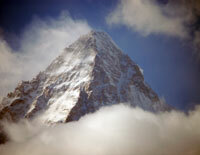 Remember that Everest saw close to 700 summits this Spring while K2 may see around 50. What we are seeing in 2018 is similar to what I personally experienced in 2014 – good weather and good support. As I’ve noted in previous post, Seven Summits Treks has taken their high volume Everest model and exported it to Pakistan. By that I mean a support ratio of 2 to 1 for support to members all climbing on a generous flow of supplemental oxygen. Now, this is not to take way from their accomplishment because summiting K2 is damned hard – and almost impossible without these support systems as evidenced with the approximately 400 summits and 84 deaths. Congratulations to all and a safe journey to the rest.